A CRM mobile app is an excellent way to connect with customers and earn their loyalty, but it is important that the app is designed in a way that creates a positive user experience (UX). Here are some ideas to keep in mind in order to design a CRM mobile app with a UX that meets your customer’s needs. One of the integral elements of a strong CRM mobile app design strategy is knowing what the users—meaning company workers—want. It’s important to incorporate user feedback not only at the beginning of the design process but throughout development. Maintain a close relationship with your users, share your ideas with them and see what they like and don’t like about the app design. With CRM apps, this means learning what type of features will help workers better manage their relationships with customers. For example, a CRM app may be designed to help a company’s service team connect with customers. By asking workers how customers prefer to communicate with the company (whether it be via email, a chatbot, over the phone or on a forum), you can develop an app that will work well for that specific customer base. Remember, the right user interface makes it easy for workers to manage their relationships with customers. This includes scheduling capabilities, payment functions and other features that relate to your particular industry. And doing so begins with understanding the unique needs of your users. Businesses sometimes make the mistake of creating an app that looks almost identical to apps from competing companies. Even if the visual elements of your app differ from the competition, it’s not wise to simply copy every feature your competitors are using. That being said, researching your industry and the world of CRM mobile apps can be useful when creating your app. For instance, one of the biggest trends in the CRM world at the moment is Internet of Things (IoT) integration. Such capabilities allow an app to create more dynamic interactions between employees and customers through smart home hubs and other devices that link up to each other via Wifi or Bluetooth. Adding IoT integration also helps companies amass more data on their customers and effectively track engagement. You need to strike a balance between following your field’s trends and finding a way to stand out. Don’t be afraid to innovate and add a feature that may be unconventional if you believe it will resonate with your users. If you’re in the real estate business, for instance, you might develop a CRM app with all the traditional elements for the field: a selection of properties, a listing of leases and titles, a spreadsheet that shows the clients that each agent works with, etc. But you could also make your app unique by creating an advanced search feature that considers a client’s financial situation, location preferences, type of home and more. An agent could then look at a client’s search history and offer a personalized answer that breaks down the pros and cons of their top five choices. A common mistake when designing a CRM mobile app is adding too much content and too many features, thereby overcomplicating the user interface. Instead, your app should be simple, intuitive and easy to navigate. Pace yourself in terms of how much content you put on each screen of your app. Adding too much right off the bat can be frustrating, so the first screen should be an introductory page. The same idea applies to your UI—pare it down to the essentials. Any visuals, including images or animations, should have a purpose. There’s no need to create a cluttered UI just for the sake of adding more visual elements. Similarly, don’t add too many features to your app. Individuals who use CRM apps are already working with a lot of moving parts, so they will appreciate an app that focuses on the essentials. A well-designed CRM app can make a huge difference for companies that juggle many clients. It can streamline operations while providing a more effective way of connecting with customers. This, in turn, will help your company achieve the continued customer loyalty it needs to stay successful. If you’re hoping to develop a CRM mobile app geared to fit your business, you will need a group of developers with the experience and technical expertise to help you do so. 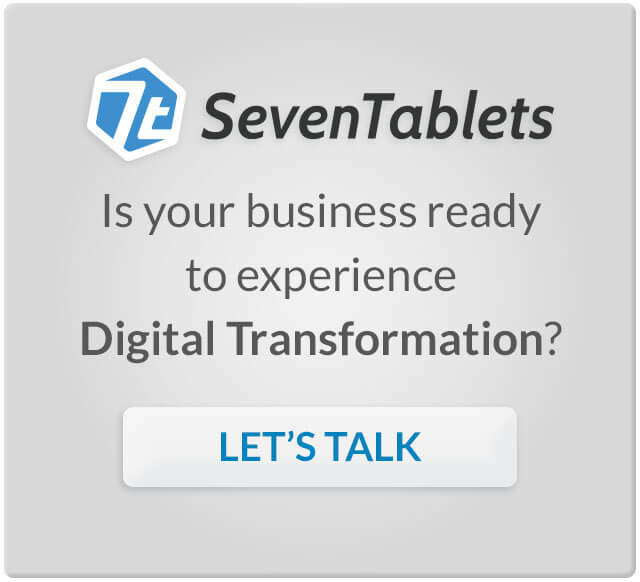 The team at SevenTablets specializes in custom mobile app development with experience in customer relationship management. We’re also well-versed in various cutting-edge technologies, including augmented reality, virtual reality, blockchain and natural language processing. While SevenTablets is headquartered in Dallas, we also serve clients in Austin, Houston, and around the U.S. To discuss your CRM mobile app project, contact us today.